New Bandy Bracelet in Moonstone by Layne Designs. It doubles as a pendant too! Moonstone, today’s featured gem, is so named because it is one of the only gems that looks better in moonlight than sunlight. This gem’s most memorable quality is a rainbow sheen that it casts in the opaque milky gray background due to reflections that occur within the various layers of Feldspar that comprise the gem. Moonstone is an amazing combination of two types of Feldspar, Orthoclase and Albite. When these two mineral heat and then cool, they settle in alternating layers that cause light to pass through the stone in a range of refractions, producing the lovely rainbow colors it’s known for. This reflective property is called adularescence. Moonstones are ideal as cabochons and require a great deal of skill to cut correctly so that the depth and axes of a stone can reveal it’s fabulous shimmer, which otherwise would not be apparent to the casual observer. This stone can occur in a variety of tones from grey to brown to clear, but are most highly valued as a transparent gem with a blue hue. 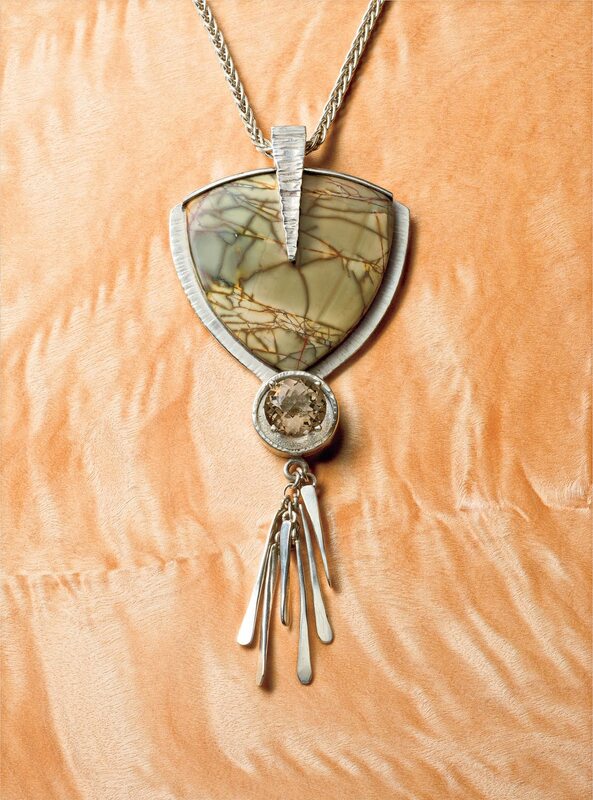 It is this classic look that most jewelry and rock lovers bring to mind when they think of the stone. In recent years, more exotic colors have appeared on the market such as orange, green, champagne, red and even black. In all colors, the defining sheen will be present. Long ago when neighbors were few and far between and communication among friends was not instant, folks would often meditate on a moonstone for answers to life's perplexing questions. Some believed that the glow of color from within was actually an ancient soul inside of the stone. Meditating over the stone, however, is not without tangible merit. The gentle blue glow of the stone actually relaxes the optic nerve when one stares at it for a few minutes. The relaxation of the optic nerve encourages the body into a meditative state. Many cultures, including the Romans and the Greeks have associated Moonstone with the moon and lunar Gods, believing the rock to be solidified rays from the moon itself. In the late nineteenth and early twentieth centuries, it was a popular choice for jewelry of the Art Nouveau movement. 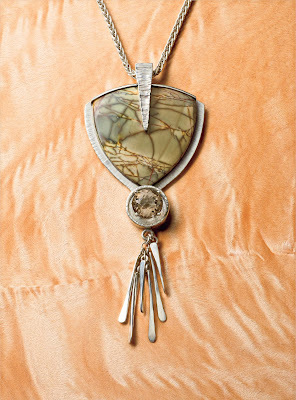 Moonstone was a favorite gem of the famous French master goldsmith, Rene Lalique, who used it in many of his creations. Recently, moonstone has jumped in popularity due to the trendy Twilight movie franchise. The heroine, Bella Swan, is rarely seen without her lovely and sizeable moonstone ring that she wears on her index finger. Brand new Moonstone pendant with Blue Topaz accent by Layne Designs! 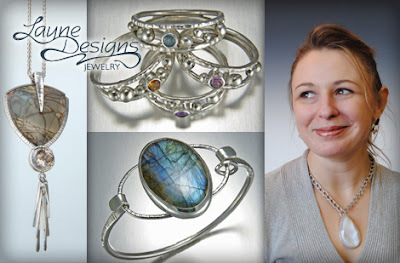 The famous saying, “a picture paints a thousand words” definitely rings true when it comes to handmade jewelry and is a lesson that every jewelry artist learns early on as they progress in their career. A tip for all burgeoning artists is to invest in quality photos as soon as you are able. Good photos convey the value of the product, feature its uniqueness, and serve as a vehicle to connect a larger audience with an artist’s work. 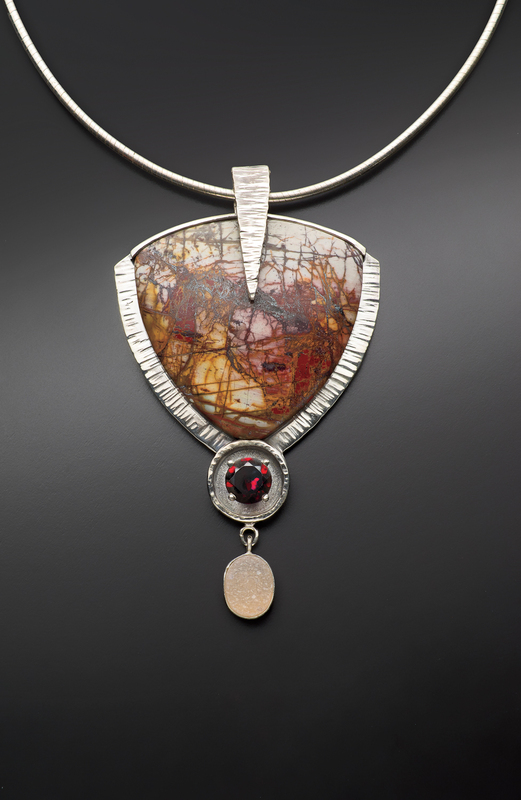 They also can be instrumental in gaining acceptance into juried art shows. Investing in professional photography is a big step for most artists, and sometimes can be a substantial financial commitment. But, lack of funding doesn’t have to keep artists from getting started cataloging and showing photos of their work. Attractive photos can be taken at home with a simple digital camera and some good natural lighting. Think first about the look and feel you want your photo to have. Think about the movement of your eye as your view the photograph. Does your eye stay entertained, or does it wonder off? Not all photographs need to have the focal piece front and center. Sometimes an unusual composition will get more attention from potential viewers than a straightforward photo of the featured merchandise. Choose a well lit location to set up your shot, preferably near a window. 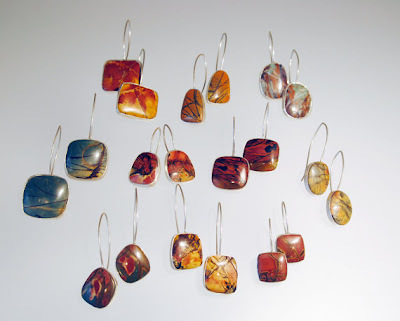 Natural light tends to work better to photograph small items with a basic digital camera. Select a setting on your camera that focuses on fine details of the focal art work. Take several snap shots to guarantee there will be a good one in the bunch. If you are fortunate enough to own some studio lighting equipment and more advanced cameras, focus more on taking a clear crisp image on a neutral background that will highlight the quality and craftsmanship of the jewelry. In all cases, consider the audience for your photos. If selling on Etsy or a similar venue, consider marketing oriented photography. This means focusing on color schemes, interesting accents, and creative set ups that support the look and feel of your business as well feature your product. If your goal is to use your photos for juried shows and grant writing, stick to photos that are clear, uncluttered and show the caliber of your work. This year, Layne Designs has had the opportunity to work with Jim Lawson Photography to photograph some of our newest work. We’re loving the compliments that are coming in! Please enjoy a a recent series of the images by Jim below. Stop by Jim Lawson’s website to view some of his work as well. Is it violet, golden, gray, colorless? 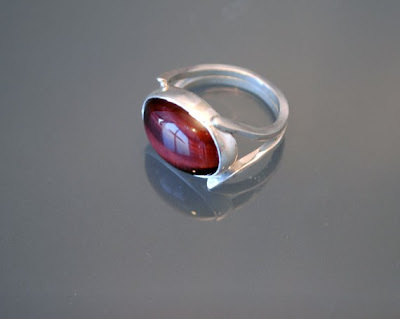 If you are looking at Iolite, the gem featured in today’s rock review, the answer is yes. Confused yet? Depending on the cut of the gem and the direction it’s viewed from, the fabulously unique Iolite can appear to be any one of these three colors due to a special trait called pleochroism, which means that it displays different colors in various directions of the gem structure. Iolite is a 7-7.5 on Moh’s scale or hardness making it a durable gem as well. It also can be easily maintained at home and only requires occasional cleaning with a mild soap solution and a toothbrush. The distinctive pleochorism feature of the gem gave the ancient Vikings an advantage when it came to navigating the seas. They mined Iolite in Norway and Greenland and used thin slices as the world’s first polarizing filter lens to view the exact position of the sun and safely plot a course to distant lands and back home again. Today, Iolite can be found in India, Sri Lanka, Mozambique, Zimbabwe, the U.S.A. and Brazil. Cutting Iolite in a way that highlights it’s pleochroism in a visually pleasing color scheme is still a rewarding challenge for advanced gem cutters today. All cuts of Iolite speak to the skill of a gem cutter, and can be appreciated by collectors for talent required to produce its beauty. 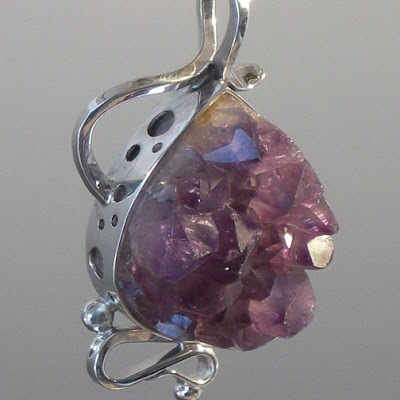 Deep violet or sapphire tones tend to be the most popular and valuable when it comes to jewelry or collectables today. Visit Layne Designs website to view some lovely Iolite jewelry that can be added to your collection! Even though the sun is still blazing, it’s time to think of chillier days that are just around the corner, and of course the updated looks we’ll all don in anticipation of autumn winds and frosty windows. Retailers are already showcasing their new autumn looks and treating shoppers to a myriad of modern classics. Those in the fashion world know that THE industry voice when it comes to fashion forward colors is the Pantone Fashion Color Report. So what can fashionistas expect to see on the runway and in display windows for this fall 2011 fashion season? Pantone, like other fashion reviews, features several colors that I like to think of as falling within the “vineyard” color scheme. You can expect to see deep burgundy, dark purples, calming sage, tones of teal and mustard on a back drop of rich neutrals in the brown family. A perfect match for the wholesome harvest vibe of autumn! For a splash of bright color, some oranges and pinks will make an appearance in sherbet tones, adding an element of fun and surprise to the tone of sophistication that is otherwise prevalent in the season's palette. A perfect way to freshen up your look for fall is through accessorizing. Most ladies have some lovely brown pieces in shades of chocolate or mocha already in their wardrobe. Consider using these staples as a canvas for your jewelry and a few selective items of clothing in trendy colors. Jewelry especially can be used to make an outfit “pop”, so be sure to choose eye catching focal pieces that you’ll wear often mixed and matched in a variety of ways. Think of items you could easily transition from a day on the job to a weekend wine tasting or a coffee date with a girlfriend. With a few simple style updates, your everyday look can be transformed into a work of art! Browse these pieces below by Layne Designs to put some color in your autumn! If you are born in August, it’s your time to shine, preferably with a Peridot adornment! The lovely green Peridot is this month’s birthstone. Many people are unaware the Peridot is actually a rare form of the mineral Olivine. Olivine is transformed into Peridot under heat and pressure, which is why the gem is often found in lava beds and even sometimes meteorites. It can vary in color from a deep lime green to a yellow green. It’s vitreous or glassy, luster makes it ideal for gem cutters and therefore the stone is often finished in a faceted cut that really shows off its sparkle! The gem is found all over the world on every continent. There are a few “famous” Peridot that can be seen around the world. One example is in Germany at the Dome of Cologne where the treasure of the Three Magi is housed. 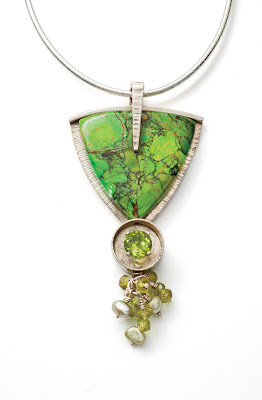 The large focal Peridot in this gorgeous reliquary was once thought to be an Emerald, oooooppps! A yellow green 192.75 carat Peridot owned by the Russian Czars is now a part of the Diamond Treasury in Moscow. Over in England, the London Geologic Museum also houses a notable 146 carat step cut Peridot. Another famous Peridot can be found in the good old U.S.A. at the Smithsonian Museum of Natural History in Washington D.C. This 310 carat, 62 gram whopper on display in the gem room is the largest known cut Peridot! The museum also features other fine Peridot Jewelry in its collection. If you would like to enjoy the beauty of Peridot a little closer to home, consider making this beauty below from Layne Designs yours. Yes, I did jump up and down squealing in delight when I got the good news. Actually, Erica, my production assistant was there and we were hugging and jumping up and down together. She had seen the hours that I was putting into the grant proposal. She even put in a few editing hours as well. If you are curious about this award, I'll give you a little background: Halstead Bead Inc was formed in 1973. It is based in Prescott, Arizona, and has always been owned by the Halstead family. The operation has shifted from jewelry selling to bead wholesaling. Eventually the business grew to a major jewelry supply operation. The Halstead's have such a big heart for artisans making the plunge into a start-up jewelry business that they began sponsoring this annual grant to jewelry start-ups in 2006. It feels so good to have a well established company tell you that you have a great business plan. My family and friends can tell me that I'm doing great and I'll always appreciate it, but it feels different coming from industry professionals. It cures some of the doubts that I have about myself and my ability to reach my goals. How did I win the Grant? I tried, and failed, and tried again. My first attempt at the grant was last year. It earned me a finalist title, which came with a snazzy plaque. Most importantly, I was given a very thoughtful feedback report from the grant committee. I realized then, that the valuable suggestions for the future of my business offered by a 40 year old company in the same industry was worth every minute that I spent working on the grant proposal. The grant application includes a list of short and long answer questions , one of which asks the applicant to present a three year business plan. If you are in the first three years of your company, it would behoove you to write a business plan regardless. The plan that I set about making last year fell short of focus, but in the feedback report, there were some sparkling suggestions of areas on which to spend my focus. Even though the report was a hefty 26 pages long, I asked some of my friends to take a look and offer suggestions. Seeking out remarks from several people with different perspectives helped me to create a focused plan that could be understood by many. One of my friends brilliantly suggested a summary or overview of the business plan. This thought hadn't crossed my mind, and I immediately went to work on it. It was now possible to touch on my many ideas quickly referenced on one page rather leafing through the following 10 pages of details. In closing, I'll say that this grant program helped me to focus my company by asking me tough questions and offering quite an incentive for well thought out answers. My plans evolved through their insightful feeback.